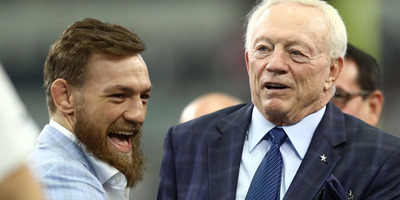 Ronald Martinez/Getty ImagesConor McGregor doesn’t seem to be sweating his recent loss to Khabib Nurmagomedov at UFC 229, and could be seen partying with Jerry Jones and the Dallas Cowboys ahead of their game against the Jacksonville Jaguars. 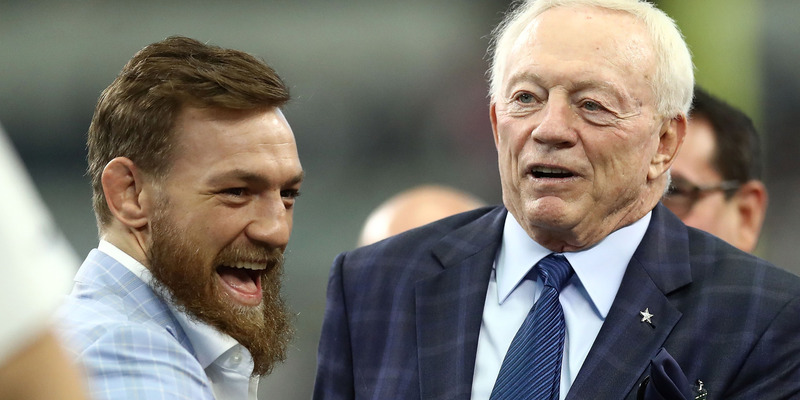 Conor McGregor was seen partying with Jerry Jones on the Dallas sideline ahead of the Cowboys game against the Jaguars on Sunday. McGregor posed for pictures and helped hype the team up before kickoff. Conor McGregor’s recent loss to Khabib Nurmagomedov hasn’t had an impact on his fabulous lifestyle. Despite tapping out to Nurmagomedov in the fourth round of their title fight, McGregor doesn’t seem too distressed about the loss, partying on Sunday alongside Jerry Jones ahead of the Dallas Cowboys game against the Jacksonville Jaguars. McGregor appeared to be having himself quite a good time, mixing it up with Jones and posing for pictures. McGregor also showed off his arm a bit, and let’s just say it might be best that he to stick to fighting. At one point, McGregor aided the team as they hyped themselves up ahead of kickoff. When the game began, it was clear that McGregor’s influence was felt on the Cowboys’ sideline. After Dak Prescott scampered into the end zone for the first touchdown of the day, he celebrated with McGregor’s “Billionaire Strut,” holding his shoulders high and swinging his arms with abandon. Running back Ezekiel Elliott would give the celebration a try as well. The Cowboys would carry the momentum all through the first half, taking a commanding 24-0 lead into halftime. With the success Dallas had with him in attendance, don’t be surprised if McGregor finds himself on the Cowboys’ sideline again sometime this season.